For her niece and daughter-in-law, see Wilhelmine of Prussia, Queen of the Netherlands. Princess Wilhelmina of Prussia (Frederika Sophia Wilhelmina; 7 August 1751 in Berlin – 9 June 1820 in Het Loo) was the consort of William V of Orange and the de facto leader of the dynastic party and counter-revolution in the Netherlands. She was the daughter of Prince Augustus William of Prussia and Luise of Brunswick-Wolfenbüttel. Wilhelmina was the longest-serving Princess consort of Orange. Berlin is the capital and largest city of Germany by both area and population. Its 3,748,148 (2018) inhabitants make it the second most populous city proper of the European Union after London. The city is one of Germany's 16 federal states. It is surrounded by the state of Brandenburg, and contiguous with its capital, Potsdam. The two cities are at the center of the Berlin-Brandenburg capital region, which is, with about six million inhabitants and an area of more than 30,000 km², Germany's third-largest metropolitan region after the Rhine-Ruhr and Rhine-Main regions. In law and government, de facto describes practices that exist in reality, even if not officially recognized by laws. It is commonly used to refer to what happens in practice, in contrast with de jure, which refers to things that happen according to law. Unofficial customs that are widely accepted are sometimes called de facto standards. Augustus William of Prussia was Prince of Prussia and a younger brother and general of Frederick II. Wilhelmina was brought up by her grandmother. On 4 October 1767 in Berlin, she was married to William V of Orange, the last Dutch Stadtholder. As a person, she was proud and politically ambitious; as a princess consort, she dominated her spouse and exerted both overt and covert influence on the politics of state. In the Low Countries, stadtholder was an office of steward, designated a medieval official and then a national leader. The stadtholder was the replacement of the duke or earl of a province during the Burgundian and Habsburg period. She was deeply involved in the revolutionary political conflict in the Netherlands from 1781 onwards – not only a supporter and partner, but as a main driving power behind the party of her spouse. She was recognized openly as the true leader of the dynastic Stadtholder party, a role its followers actively encouraged her to take. She was in heavy correspondence with foreign powers and used foreign supporters to influence Dutch internal policy. In 1785, her spouse was forced to leave Den Haag and put under a demand to abdicate. Wilhelmina persuaded William not to give in, and subsequently went to Friesland – officially to visit a jubilee, but in reality she aimed to gain support in the ongoing political conflict. In 1786, the family moved from the capital at the Hague to Nijmegen. After the revolution proper broke out in 1787 and William had moved his court to Guelders, she attempted to return to the Hague; on 28 June 1787, she was stopped at Goejanverwellesluis, waiting for permission to continue to her destination; at the end of the day, permission was denied and she was sent back to William. Guelders or Gueldres is a historical county, later duchy of the Holy Roman Empire, located in the Low Countries. The Goejanverwellesluis is a lock in Hekendorp, Netherlands. The 'Goejannen' - the men from the surrounding polders who went to sea - said their last farewells by this channel. Both Wilhelmina and her brother, King Frederick William II of Prussia perceived the occurrences as an insult. After having returned to Nijmegen, Wilhelmina asked her brother for a military intervention. Frederick, despite having been in power for only a year, attacked the Dutch Republic on 13 September 1787. Many rebels had to flee to France, and William was restored to power. With the support of foreign troops, Wilhelmina returned to The Hague and was celebrated by her followers as the true ruler of the Netherlands. Frederick William II was King of Prussia from 1786 until his death. He was in personal union the Prince-elector of Brandenburg and sovereign prince of the Canton of Neuchâtel. Pleasure-loving and indolent, he is seen as the antithesis to his predecessor, Frederick II. Under his reign, Prussia was weakened internally and externally, and he failed to deal adequately with the challenges to the existing order posed by the French Revolution. His religious policies were directed against the Enlightenment and aimed at restoring a traditional Protestantism. However, he was a patron of the arts and responsible for the construction of some notable buildings, among them the Brandenburg Gate in Berlin. However, the Dutch patriots returned in 1795 with support from the French, and William fled to his ally, his cousin George III of England. During their exile, the couple lived in Kew until 1802, and subsequently went to Germany, where they lived in Nassau and Braunschweig (where William died in 1806). Thereafter, Wilhelmina and her daughter – both having been widowed in 1806 – lived together at various places in the Confederation of the Rhine. 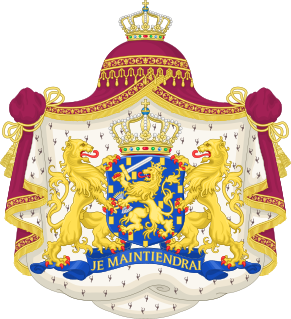 The Patriottentijd was a period of political instability in the Dutch Republic between approximately 1780 and 1787. It takes its name from the radical political faction known as the Patriotten who opposed the rule of the stadtholder, William V, Prince of Orange, and his supporters who were known as Orangists. Kew is a district in the London Borough of Richmond upon Thames, 1.5 miles (2.4 km) north-east of Richmond and 7.1 miles (11.4 km) west by south-west of Charing Cross; its population at the 2011 Census was 11,436. Braunschweig, also called Brunswick in English, is a city in Lower Saxony, Germany, north of the Harz mountains at the farthest navigable point of the Oker River which connects it to the North Sea via the Aller and Weser Rivers. In 2016, it had a population of 250,704. 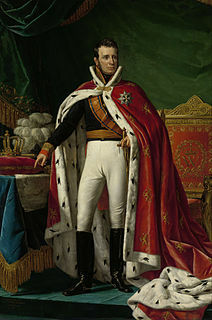 William, the son of William V and Wilhelmina, went with them into exile, but returned to the Netherlands in 1813 to become King William I of the Netherlands, the founder of the present Dutch monarchy. Wilhelmina and her daughter returned to the Netherlands in 1814. She received Tsar Alexander I of Russia in Haarlem in 1815. William I was a Prince of Orange and the first King of the Netherlands and Grand Duke of Luxembourg. Alexander I reigned as Emperor of Russia between 1801 and 1825. He was the eldest son of Paul I and Sophie Dorothea of Württemberg. Alexander was the first Russian King of "Congress" Poland, reigning from 1815 to 1825, as well as the first Russian Grand Duke of Finland, reigning from 1809 to 1825. Frederika Luise Wilhelmina (28 November 1770 in The Hague – 15 October 1819 in The Hague), married in The Hague on 14 October 1790 to Karl, Hereditary Prince of Brunswick (1766–1806), a son of Karl Wilhelm Ferdinand, Duke of Brunswick-Luneburg and Princess Augusta of Great Britain, without issue. Willem Georg Frederik, Prince of Orange-Nassau (15 February 1774 The Hague – 6 January 1799 in Padua), unmarried and without issue. The House of Orange-Nassau, a branch of the European House of Nassau, has played a central role in the politics and government of the Netherlands and Europe especially since William the Silent organized the Dutch revolt against Spanish rule, which after the Eighty Years' War (1568–1648) led to an independent Dutch state. William V, Prince of Orange was the last Stadtholder of the Dutch Republic. He went into exile to London in 1795. He was the reigning Prince of Nassau-Orange until his death in 1806. In that capacity he was succeeded by his son William. William IV was Prince of Orange-Nassau and the first hereditary stadtholder of all the United Provinces. Amalia of Solms-Braunfels, was Princess consort of Orange by marriage to Frederick Henry, Prince of Orange. She acted as the political adviser of her spouse during his reign, and acted as his de facto deputy and regent during his infirmity from 1640–47. She also served as chair of the regency council during the minority of her grandson William III, Prince of Orange from 1650 until 1672. She was the daughter of count John Albert I of Solms-Braunfels and countess Agnes of Sayn-Wittgenstein. Anne, Princess Royal and Princess of Orange was the second child and eldest daughter of King George II of Great Britain and his consort Caroline of Ansbach. She was the spouse of William IV, Prince of Orange, the first hereditary stadtholder of all seven provinces of the Northern Netherlands. She was Regent of the Netherlands from 1751 until her death in 1759, exercising extensive powers on behalf of her son William V. She was known as an Anglophile, due to her English upbringing and family connections, but was unable to convince the Dutch Republic to enter the Seven Years' War on the side of the British. Princess Anne was the second daughter of a British sovereign to hold the title Princess Royal. In the Netherlands she was sometimes known as Anna van Hannover. Princess Carolina of Orange-Nassau was a Dutch regent. She was the daughter of William IV, Prince of Orange, Stadtholder of the Netherlands, and Anne, Princess Royal. She was regent of the Netherlands from 1765 until 1766 during the minority of her brother. The Nieuwe Kerk is a Protestant church in the city of Delft in the Netherlands. The building is located on Delft Market Square (Markt), opposite to the City Hall. In 1584, William the Silent was entombed here in a mausoleum designed by Hendrick and Pieter de Keyser. Since then members of the House of Orange-Nassau have been entombed in the royal crypt. The latest are Queen Juliana and her husband Prince Bernhard in 2004. The private royal family crypt is not open to the public. The church tower, designed by Pierre Cuypers and completed in 1872, is the second highest in the Netherlands, after the Domtoren in Utrecht. Luise of Brunswick-Wolfenbüttel was daughter of Ferdinand Albert II, Duke of Brunswick-Lüneburg and his wife Antoinette of Brunswick-Wolfenbüttel. Tethart Philipp Christian Haag was a Dutch artist and court painter to William V of Orange-Nassau and the director of cultural institutions in The Hague. Friederike Luise Wilhelmine of Prussia was the first wife of King William I of the Netherlands and so the first Queen of the Netherlands. Princess Louise of Prussia was the third surviving daughter and ninth child of Frederick William III of Prussia and Louise of Mecklenburg-Strelitz. Charles Christian, Prince of Nassau-Weilburg, till 1753 Count of Nassau-Weilburg, was the first ruler of the Principality of Nassau-Weilburg between 1753 and 1788. Louise Henrietta of Nassau was a Countess of Nassau, granddaughter of William I, Prince of Orange, "William the Silent", and an Electress of Brandenburg. Princess Pauline of Orange-Nassau was a Princess of the House of Orange-Nassau. Princess Frederica Louise Wilhelmina of Orange-Nassau was a Hereditary Princess of Brunswick; married 14 October 1790 to Hereditary Prince Charles George August of Brunswick-Wolfenbüttel, son of Charles William Ferdinand, Duke of Brunswick-Wolfenbüttel. She was known in the family as "Loulou". The Act of Guarantee of the hereditary stadtholderate was a document from 1788, in which the seven provinces of the States General and the representative of Drenthe declared, amongst other things, that the admiralty and captain-generalship were hereditary, and together with the hereditary stadtholderate would henceforth be an integrated part of the constitution of the Dutch Republic. Moreover, members of the House of Orange-Nassau would have the exclusive privilege to hold the office. The Act was in force until the Batavian Republic was established in 1795. Sometimes jewellery used by the Dutch royal family are dubbed "crown jewels". In the past, the terms "House-diamonds", "House-jewels" and "family jewels" have been used. In 1790 the term "Bijoux de la Couronne" was used by Luise of Brunswick -Wolfenbüttel to refer to a large diamond from Borneo. In 1896 the Firm of van Kempen & Begeer wrote about resetting the jewels of the Crown. Queen Juliana gave a selection of her formal jewelry to the new Foundation Regalia of the House of Orange-Nassau, instituted on 27 July 1963. In 1968 a Foundation "Kroongoederen van het Huis van Oranje-Nassau" was instituted. It owns the regalia and the House-jewels. ↑ Genealogie ascendante jusqu'au quatrieme degre inclusivement de tous les Rois et Princes de maisons souveraines de l'Europe actuellement vivans [Genealogy up to the fourth degree inclusively of all the Kings and Princes of sovereign houses of Europe currently living] (in French). Bourdeaux: Frederic Guillaume Birnstiel. 1768. p. 17. The generations are numbered from the ascension of Frederick I as King in Prussia in 1701.